Wilbur is perhaps the most famous farm animal to escape the slaughterhouse. Ivan was not destined for the slaughterhouse, but he faced a grim future. And now we have Audrey. 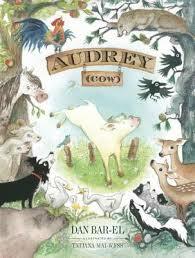 From the publisher: Audrey is a cow with poetry in her blood, who yearns for the greener pastures beyond Bittersweet Farms. But when Roy the horse tells this bovine dreamer that she is headed for Abbot’s War, the slaughter house, Audrey knows that she must leave her home and friends sooner than she ever imagined. With the help of a whole crew of animals and humans alike, Audrey attempts to escape the farm she lives on–and certain death. Cleverly written as an oral account, this unique illustrated tale of an animal on the run, told “to camera”, uses over thirty narrative voices, including six humans, four cows, three sheep, two sheep dogs, one pig and a very silly rooster. Full of heart and humor, Audrey (cow) is ultimately a very human story about life and death, friendship, and holding on to one’s dreams–based more or less on a true story. This is great book for taking to kids about voice. With so many characters, it is hard to believe that each one has a unique voice, but they do! Dan Bar-El is an artist with words. One cow’s grief over losing her son is compared to “a mist like we’d get on gray, foggy mornings that made the farm seem as if it were fading away along its edges”. Humor, realism, sadness, adventure and a lot heart make this a wonderful book, and an excellent read aloud. It would also be fun to create a class writing project trying to emulate this style in different setting, depending on what you are studying. I highly recommend Audrey (cow). It would make a great gift for an elementary school student if you are still looking for books to give during this holiday season.